Do you spend your days scurrying from meeting to meeting? Do you ever wonder why you're sitting in this particular meeting? Do you ever wonder if all these meetings are really necessary? (They aren't) Or whether there isn't some better way to get this work done? (There is) This book is both like and unlike many other collections of ideas for effective meetings. Like others, it's packed with ideas and suggestions that will reduce the time you spend in meetings, and make the time you do spend in meetings much more productive and less stressful. Unlike others, this tip book also provides suggestions for organizational leaders — ideas for adjusting the organizational culture to support meeting effectiveness, while at the same time reducing the need for meetings. Meeting Madness afflicts almost every organization. And as we make more use of dispersed teams and outsourcing, we become increasingly dependent on meetings, because of the more limited opportunities for casual communication. If we ever find our way out of this meeting mess, we can be sure that making meetings more effective, less numerous and shorter will be features of the solution. This tip book shows you how. In my own experience, and in the course of working with clients in my consulting and coaching practices, I've learned a lot about what works and what doesn't when we try to make meetings more effective. Some of what I've learned is just good practice and has appeared in the literature over the years. But much is very new, developed in response to the rapid structural and technological change that has swept through today's office. 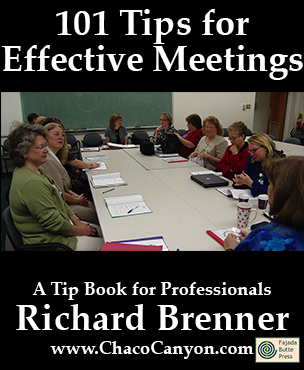 This tip book is both like and unlike many other collections of ideas for effective meetings. Like others, it's packed with ideas and suggestions that will reduce the time you spend in meetings, and make the time you do spend in meetings much more productive and less stressful. Unlike others, this tip book also provides suggestions for organizational leaders — ideas for adjusting the organizational culture to support meeting effectiveness, while at the same time reducing the need for meetings. Include with the agenda a not-agenda: a list of topics that are off limits for this meeting. Indicate when these items might be expected to be on a future agenda. Rarely is visiting a subordinate's meeting a good idea. The risk of disrupting the meeting is high, but your visit can even disrupt relationships between the meeting participants. People who ordered this item also ordered 21st Century Business Travel: Tips for the e-Enabled Business Traveler and 303 Tips for Virtual and Global Teams.Measure the average percentage of time that people in your organization spend in meetings. Use cleverness, creativity and brainpower to try to drive it lower. If you have too few conference rooms, people feel compelled to book them far in advance, which creates a false need for regular meetings, which in turn increases the demand for conference rooms. If you ever notice that all the conference rooms are booked, create more. Since no meeting should go more than 90 minutes, presentations that run longer than 15 minutes significantly cut into the time available for discussion. If you want people to hear a longer presentation, schedule a presentation, not a meeting. Click the folder icons to reveal (or hide) chapter content summaries. Reveal all chapter content summaries. Make the first item "Review Agenda"
This item is also available by the single copy (USD 7.77 per copy), in 10-copy packs (USD 6.00 per copy), in 50-copy packs (USD 5.40 per copy) and in 100-copy packs (USD 4.99 per copy). 101 Tips for Effective Meetings, 500-pack is in Acrobat format, which gives you several advantages. You can print it, and read it like any book. Or in electronic form, you can use the search capability of Adobe Reader to find passages of special interest to you. If you load it onto your laptop, tablet, or other mobile device, you can read it anywhere — and it's weightless, too. 18 pages.